Have you tried “sundae”? 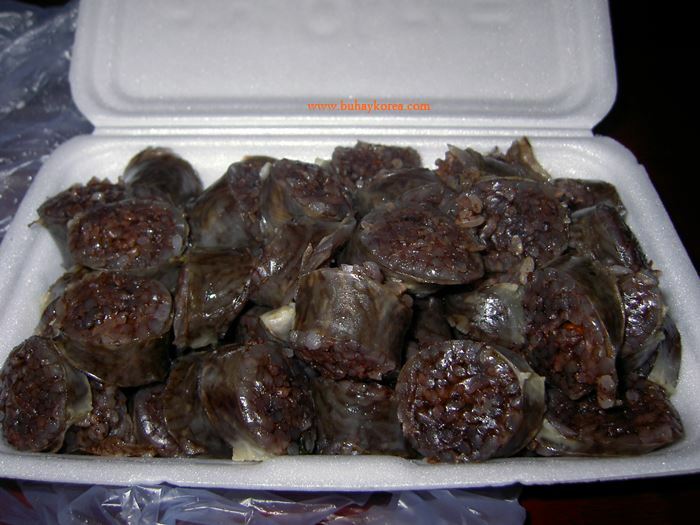 It is Korean blood sausage that you could get from kiosks on the street. The romanization “sundae” seems like the dessert but it should be pronounced as “soon de”. This popular Korean street food is made from pig’s blood and Korean glass noodles. It is encased in pig intestine ~ just like an ordinary sausage or even the Filipino style sausage we call “longanisa”. I’m used to eating pork blood as in the Philippines we have what we call “dinuguan” which is a stew made of pork blood. One order (as in the photo) of “sundae” is only 2,000 KRW. It is best eaten dipped in salt and red pepper powder. It doesn’t really have a lot of flavor ~ although it tastes a little bitter. Better have a bottle of beer with you as “sundae” goes well with it. try dipping sundae in samjang. when we lived in ulsan, they usually give samjang sauce (thinned samjang…hey add lots o water until you get the consistency of ketchup)and it really complements the flavor of the sausages. have you tried ojinggo sundae?…thats really yummeh! Is that cooked? It looks really adventurous. I get this at my local Asian market and absolutely love it!